We don't necessarily have a min/max job cost, but we typically work with clients on creative solutions for their home design or renovation projects in this range. 21 Projects for William J. Fugo Jr.
10 Reviews for William J. Fugo Jr.
We hired Will to assist in a complete renovation of our lower level. The project included a full kitchen renovation, the addition of a gym and also a temperature controlled wine cellar. Will was a pleasure to work with. He is a consummate professional, totally reliable and very thorough. He brought outstanding experience and very original ideas to our project. He was there for us every step of the way-from the initial concept meetings, drafting the plans, bidding out the project to contractors, getting permits, and all the way through until the end. Will kept our project moving and advised us accordingly through the inevitable unforeseen issues that arise in a project of this scope. 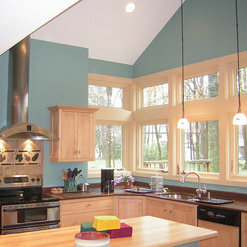 He worked well with our general contractor and also our interior designer. I give Will the highest recommendation possible. Earlier this year I decided on renovating and expanding an existing 50+ year-old, two story, 2 car garage at my residence in Pepper Pike. I had ideas on a cost-effective way to add a 3rd bay and sought out an architect to assist with the project as I was serving as my own general contractor. I spoke with about 4-5 candidates and settled on Will as he showed a real appreciation for what I was seeking to accomplish. The expansion, while not massive, presented its challenges. There was a structural issue with the existing floor joists - Will put me in contact with a structural engineer who designed a fix (steel beam) and stamped validation. The city required plans for Architectural Review Board (ARB) approval - Will's drawings met all the ARB's requirements and were approved at the first review meeting (which he attended with me). He then also generated the plans for the build itself which involved engineered trusses, relocation of a staircase and utilization of an existing load-bearing wall. This was a time sensitive project. Will delivered on his commitments on-time and came well prepared for our planning meetings. I would highly recommend his services. Will has a fantastic vision for lighting! I have worked on several projects over the years, both directly with him and with his clients within our Lyndhurst showroom. He has a great talent of incorporating all aspects into his design vision. Lighting being so important, I have a lot of fun working with him. He is creative, motivated and highly professional. I always look forward to seeing him, and helping with his projects. I hired William as the Architect for the two story addition to my colonial. I wanted someone who would embrace my project, who was familiar with the homes in my area, and who would design an addition that allowed me to maintain the integrity of the home. William was very professional, down to earth, very organized, creative, resourceful and innovative. He took the time to explain everything to me and most importantly he listened to my needs, and worked to ensure my satisfaction. We had to obtain a variance from the City due to lot size constraints and he was so outstanding at building relationships and understanding the overall process that our variance was approved with no issues. My addition is almost complete (about two weeks to go), and the design is fabulous, it looks as if it is part of the original structure. William was wonderful to work with, I would hire him again, and highly recommend him for any project. I have worked with William on residential and commercial design projects for many years. 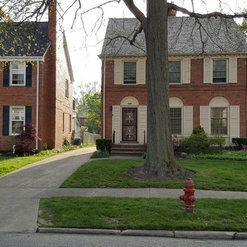 The House in Bay was the largest residential project. I am an extremely good gardener, so I loved my 82 windows without drapes that allowed natural light and the beauty of my yard to be seen from every part of the house. This incredible house on the hill, although new construction, blended beautifully between two historic homes built in 1840 and 1870 as winter homes. The summer homes were on the beach across the street. We based the home on a Victorian architectural style. When you stood at the front door you could see through the entire house to our incredible fireplace with ceramic blue tiles from France. As you entered you passed parlors: dining, piano, kitchen, TV room and then into the living room with a second floor balcony. The "Chef's Kitchen's" terrazzo flooring sparkled. Summer and winter the flooring was wonderful to stand on for hours, warm in the winter and cool in the summer. Beautifully designed cabinetry for my extensive collection of table top dishware, floral vases, cookware etc. 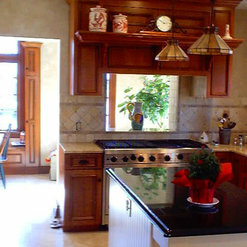 The curved counter in the kitchen, was were family and friends gathered for hors d'oeuvres, or to help us cook or to enjoy a breakfast buffet. Transitioning from room to room was always enjoyed by our guests. The carpeting in every room was uniquely designed with colorful inserts. The living room and dining room carpeting were richly constructed like a man's Italian suit jacket. Magical light fixtures in every room, of course with dimmer switches to adjust to the outside light. Uniquely designed wall space for the incredible artwork my children produced throughout their childhood. 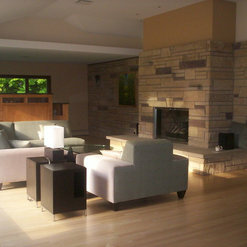 The centerpiece of the two story living room was the fireplace surrounded by windows. A television nestled between the classic white columns, was artistically hidden with a stainless steel curved furniture piece with a corrian top, designed by the architect. This furniture piece was ideal to display sculpture, a vase filled with my garden flowers or candles. William's ability to select furniture to fit the space, made this a very special room filled with warm, comfy couches that engaged us all in conversation. On the second floor the bedrooms provided space and privacy, but also space for children to gather and enjoy each other's company: the computer room had 3 stations; the balcony overlooking the 2 story living room was ideal for sleepovers. As teenagers, they enjoyed the privacy of the basement with a dedicated mirrored work out room, TV room and built in dry bar space. For those of you that are crafty, this space worked beautifully for wrapping gifts, cutting out patterns or just conversation. The stainless steel ship mast columns added to the luster of this underground space. Every bathroom, 6 in all, was unique; the master with a curved shower surrounded by windows, the guest bathroom nestled between the piano and TV room and the two private bathrooms in a bathroom. My home office, on the first floor felt like a porch surrounded with windows. I felt like I was outside the entire time I worked on my computer or on the phone at my desk. The built in 6 drawer cabinetry was ideal for storing my supplies for the wrapping of gifts. The built in closets were perfect for all the important documents you accumulate for your family over the years. 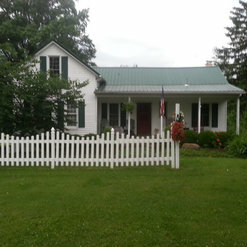 Porches: the house was wrapped in porches on 3 sides with a gazebo off the kitchen. For the holidays, the banisters were decorated with garland and holiday lights and red ribbons. Snow just made the house stand out even more. The exterior blue trim detail against the classic white, made the house stand out on bright sunny days, and even on the grey cloudy days. When constructing the house we worked with the landscaper to save as many trees near the house as possible and it worked. 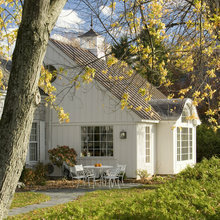 The side garden off the gazebo and dining room was a precious private space of hydrangeas, red leaf maples and azaleas. The keyhole garden off the front porch filled with daffodils and tulips each spring. Then every blooming roses and lilac trees graced our white fence and red brick path. 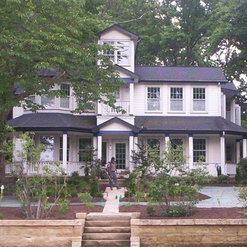 William's architectural exterior and interior design abilities created a home that was a gift to my family and our community. 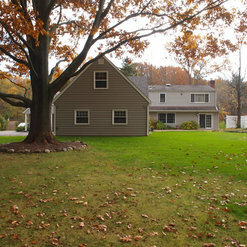 It was an incredibly special home to raise my children in and entertain family and friends. Every day, a beautiful holiday! 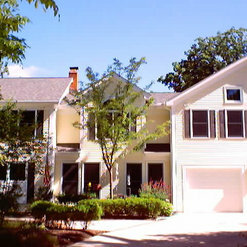 We have been working with Will Fugo for over 12 years on a variety of remodel and new construction projects. 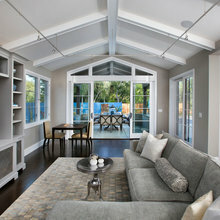 This has included structural changes to a 'great room', a gazebo addition, and bathroom, bedroom and kitchen remodels. 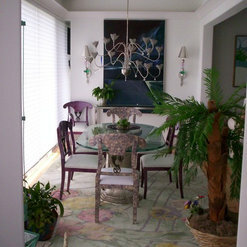 He has also created outdoor patio design to coordinate with the interior work. Will is creative, thorough, professional and always comes up with the one idea that really highlights our preferences in design. 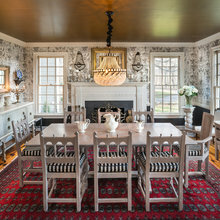 His attention to detail can also be seen in design, layout, color and texture of furnishings. He worked closely with our furniture builder to insure the designs became reality. We have recommended him to friends and they have had similar success. 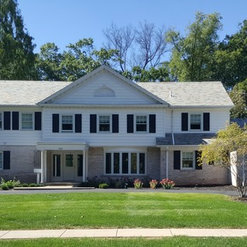 William J. Fugo Jr.’s approach to architectural requirements resulted in a final design that exceeded all our expectations. He met with us in our home, discussed our likes and dislikes, and actively listened to our goals for the project. He came to each meeting with creative options and together we walked though each element of the design. During the process he asked probing questions to help refine what we actually wanted, not relying on what we thought we wanted. This process challenged us to think outside the box and helped hone in on the perfect solution. I highly recommend the concept exploration methodology Will uses. Will’s keen eye for style, scale, and combinations of materials achieved a final plan that is just gorgeous! 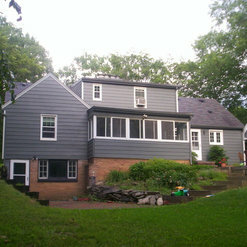 Will created a design to transform an older home into a perfect family home. His vision allowed us to move a home from the 1950's and create a lovely home for entertainment and also say-to-day family living. Will worked with the home owner, the builder and the vendors. He developed plans and made sure that he preserved the character of the house, while moving it squarely into 2014. This is the 2nd time we have engaged Will. He has great vision, is very creative and draws upon his many prior engagements to suggest ideas. Having been in the design-build industry for 25 years and completing multiple high profile projects in Ohio and Florida with William Fugo, I am able to definitively state that he is most outstanding professional I have ever collaborated with. His skill at developing project parameters sets the tone for devising design and functional concepts for each project. This approach is consistent regardless of the size of the project. 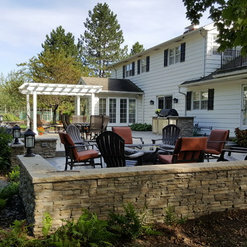 Large projects including those designated: “Wilderness,” “Valley Overlook” and “Canalside” were complex whole building renovation and additions - yet the attention to detail was maintained throughout the process. His ability to bring highly creative and effective designs to the client is consistently remarkable. Coupled with this architectural skill is the very rare skill to carry the design process to the projects interior. The ability to design interior elements to improve traffic flow, food servicing, senior living amenities, architectural details & finishes, lighting, color selections and furnishing selection & procurement while collaborating with other professionals ensures the finished project routinely exceeds expectations. 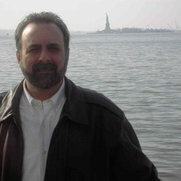 William Fugo is a methodical project partner. His work is always organized, documented clear & concise and timely. This directly impacts the ability to keep a project on budget and on time. He works exceptionally well with owners, clients and other professionals. This capability also includes the ability to collaborate with technical specialists, contractors and trade professionals - this skill is a source of great relief during the complex construction process. 6 Ideabooks for William J. Fugo Jr. Commented: is the island top butcherblock, how was it finished.Yes, the island is butcher block and was finished with a food-safe mineral oil.